We have hitherto published technical articles on sailplanes owned by our members or on gliders, which have distinguished themselves by breaking records. Some gliders are quite remarkable from the technical point of view and also deserve to be described. The first Elfe’s belong to this category. They weighed only half as much as there pilots and yet had good gliding angles at low and high speeds. Should this not be sufficient to warrant our attention, we can add that the four were built. Two of them in good condition, are in Switzerland, and a further two in were built in Brazil, in 1943 Elfe 1 with 9m span, which still exists and in 1957 Elfe 1 with 10m span, which crashed in 1959. It is surprising that a considerable amount of publicity should have been given to the Darmstadt D.28 “Windspiel” which had an empty weight (with parachute) of 56 kg, a wingspan of 12m and a max L/D of 1:23, and very little attention to the Elfe, which had an empty weight of 43 kg, a wingspan of 9m, for the same glide angle as the “Windspiel”. This may be due to the fact that the first “Windspiel” flew in 1933 whereas the first Elfe flew only in January 1939 when the clouds of war already hung over the horizon. The fact that the flight took place in Switzerland might not have favoured the plane’s publicity. However, Swiss pilots who visited England after the war did bring stories of the incredibly minute sailplane that could be carried over the mountains to flying clubs by three men. Yet nobody in Britain had ever seen photographs or drawings of it until recently. During the 1930’s, the Swiss gliding movement was fortunate in enjoying the services of first-class designers such as Jacob Spalinger, August Hug (designer of the Spyrs), the Mueller brothers (Mosweys) and Werner Pfenninger (The Elfes). 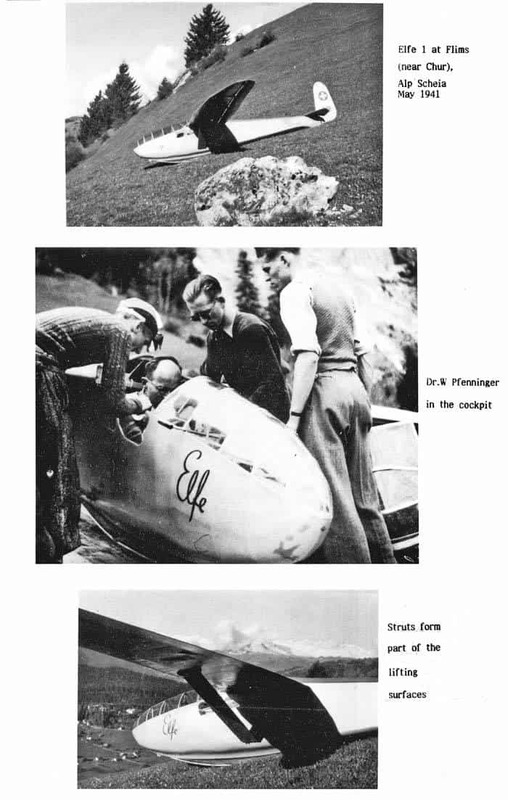 The latter was so remarkable that after having produced the world’s second laminar flow profiled sailplane in 1946/47 (the first being the unsuccessful Horten 4B tailless of 1944), Pfenninger emigrated to work for an American aircraft company, leaving his designs to be developed by Albert Neukom, in Switzerland. We must however return to the first Elfes, namely the 1939 and the 1944 prototypes. Both still exist but there are no plans to make them airworthy as pilots are usually not light enough to fly them, nor are modern tow planes slow enough to tow them. The provisional cockpit load was 80kg. The max. cockpit load as per the last C of A of 1949, is 100kg. A person with a long upper body would not fit into it comfortably into the cockpit. The machines are often exhibited at various institutes and public places. The first prototype was designed by Pfenninger in 1938 and built by R. Saegesser, F. Niederhauser and P. Schenkel during the same year. It flew at the beginning of 1939. It was designed to meet the, following requirements. Good manoeuvrability (especially initial manoeuvrability), a wide speed range, the safest possible stall characteristics, a good max L/D and the lowest sinking speed. Werner Pfenninger specially developed the wing profiles. The inner wing was swept forward, allowing the pilot in his spacious cockpit to lie back and still have good visibility. Had the wings not been swept foreword, the pilot, centred ahead of them, would have caused the aircraft to be nose-heavy because of the ultra-light tailplane and short tail arm, The outer wing was slightly swept back and the wing tips inclined downwards to give the flap/aileron ground protection. Particulars of the wings are: a double-T main spar with a torsion box ahead of it covered with 1 mm and 1.2 mm plywood. The largest depth of the main spar is 55 mm at the strut/wing connection points and the spar depth is 17 mm at the wing roots. The aircraft’s flying characteristics, manoeuvrability and performance came up to the highest expectations. The controls were extremely sensitive to slightest movement. In slow flight, with flaps lowered, the Elfe could stay with almost every other machine. Clean, or with slightly raised flaps, the gliding angle seemed remarkably flat at speeds between 70 and 90 kph. The first Elfe could carry a load of 30 kg (for an empty weight of 43 kgs). The fuselage and the rudder weighed together 21 kgs. The wings weighed 13kgs. The struts weighed 2.5 kgs and the tailplane 1.5 kgs. A second Elfe prototype built in 1944 had a span of 10.5 m and an empty weight of 65 kgs. The max L/D was 1:24. These weights did not compare favourably with those of the “Windspiel”. 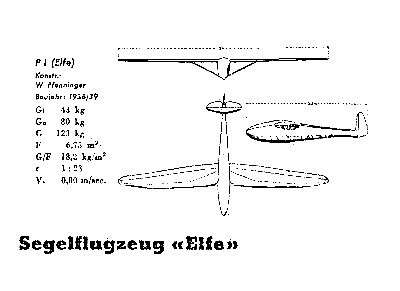 This 1944 Elfe, which is referred to as the Elfe 2, could carry a load of over 95 kgs and had a span of 10.60 m, and its L/D was believed to be 1: 7. It was recently found in a cellar in Aachen. The Elfe built in 1946/47, which is referred to as the Elfe PM1 (P for Pfenniger, M for Markwalder) had laminar flow profiled wings. 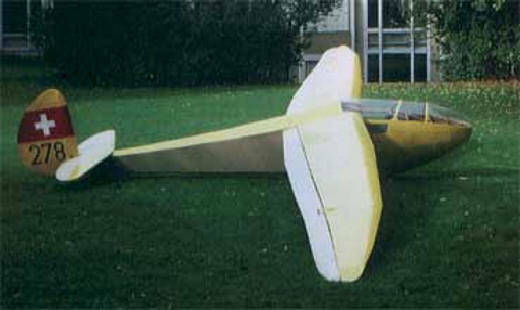 It had a span of 15.40m and L/D of 1:41I and unfortunately crashed during one of its first test flights as a result, we believe, of tailplane flutter, but the design led directly to the later Elfes which were built in wood and had a different fuselage. 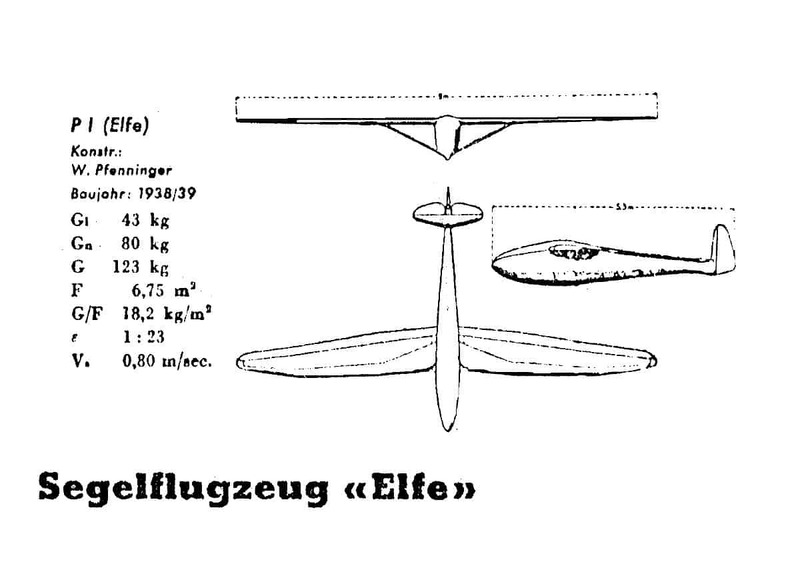 However, the 1946 Elfe, which had a 16 m wing span, gave promise of a Max L/D in excess of 1:40. 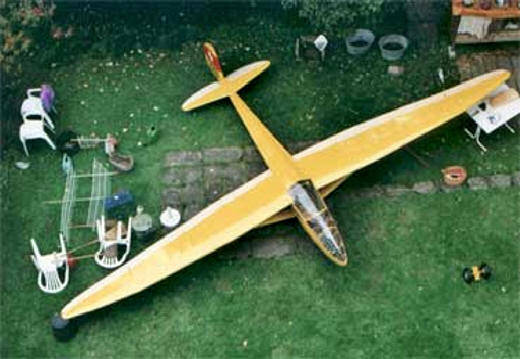 Karl Huber Huber, who built the Elfe PM 1, started to build the fuselage of the planned production version (Elfe PM 2 HB-533, with 16m span), but it was never finished, and burnt during a workshop fire in 1973. Herr Huber had flown the Elfe 2 and also mentioned the Elfe 1. He said that the aircraft had not been easy to fly because of its flaps. However, for its small size, it had truly amazing flying characteristics, but its minimum sinking speed must have been considerable.